Like many people, I’ve taken a beautiful trip to a sunny and warm seaside. I walked on the beach, scoured the sand to find shells and other tidbits, watched the birds in search for food, and felt the warmth of the sun and rhythms of the waves. I walked in the shallow water with family and friends, touching the refreshing coolness on a warm afternoon. I played in the fine sand building castles and covering up feet. And I watched countless others also enjoying the same beach. The sunny seaside can be so relaxing, rejuvenating and fun. But don’t take my word for it. This article about a new book by marine biologist Wallace J. Nichols offers scientific explanations why looking at, being around, in or under the water can make us feel better in many ways. Are you a dancer by the sea? Here’s a challenge… can you try to NOT get caught up in the movement of this upbeat beach dance video? Of course the seaside also has days of cold, howling winds, rain, ice and deadly storms. But it is so much fun to dance at the water’s edge on a beautiful day. Like many of my other paintings, I found inspiration for this piece at the water’s edge. 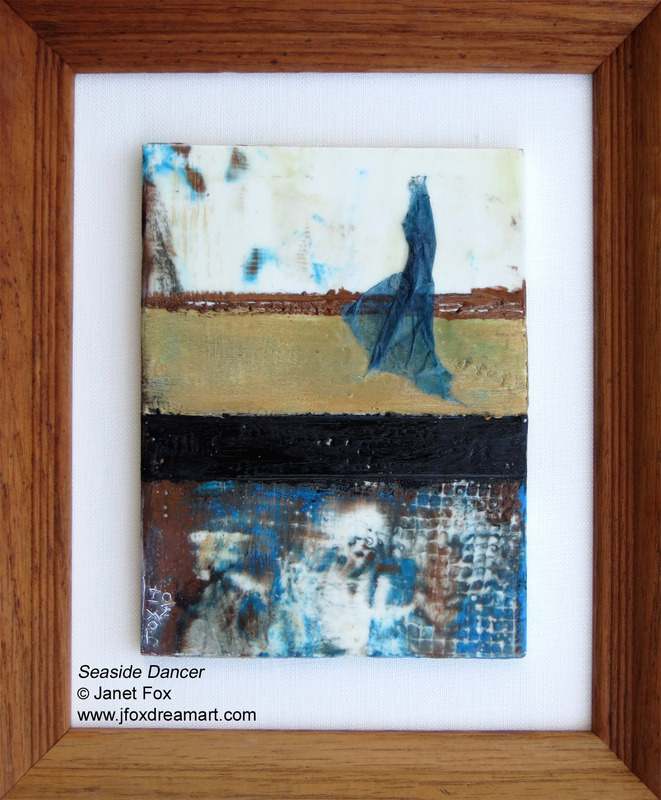 This encaustic painting, “Seaside Dancer” captures a somewhat reflective tone of a solo dancer with a flowing aqua-marine scarf blowing in the breeze. It is one of several artworks in a seaside-themed grouping. What do you like to do at the seaside? ⇒ Feel free to add your note about this post or view others’ thoughts by clicking “Leave a Comment / Comments,” below. ⇒ For information about purchasing this artwork, contact Janet Fox.